Scrolls are a bit of a hit here and I’m sure they are a favourite in lots of houses. They are awesome in lunches and we do lots of flavours of them at Kidgredients. 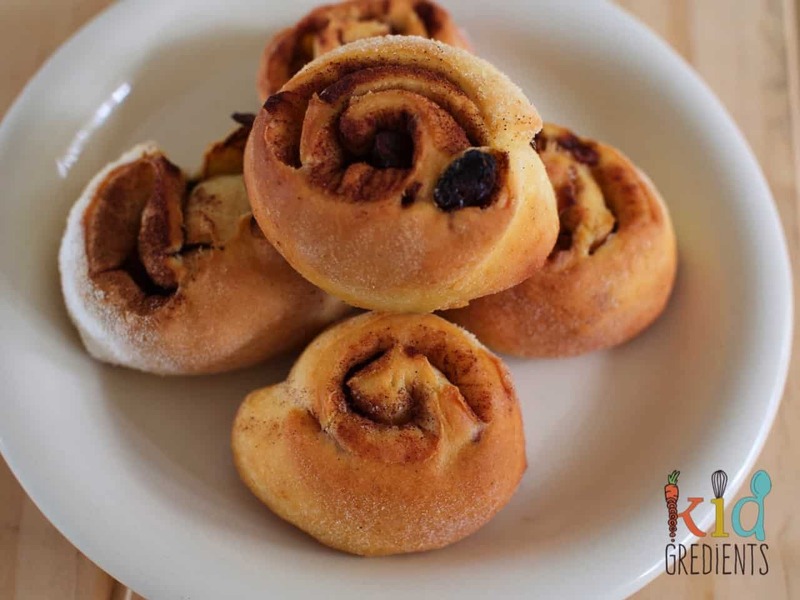 These cinnamon sultana scrolls are perfect for a sweet morning treat, or to pop in the lunchbox! They freeze well, they defrost well, they basically get eaten without any nagging (in fact Master 5 has helped himself to them frozen from the freezer!) and they are so easy to make. The cinnamon in these means you don’t need any extra sugar, which is a bonus and the sultanas plump whilst baking. The yoghurt dough is so easy to make, but it still has that “bread” feel, whereby you could almost think these were yeasted and made in the traditional method. If you’re putting these in lunch boxes, defrost in the lunch box overnight in the fridge for the best results, although in warmer weather they will defrost in the lunchbox during the day. I promise once you’ve made these once you’ll be making them again and again. I can almost make them with my eyes closed now. These are also delicious if you swap the sultanas for dried cranberries. My daughter prefers cranberries to sultanas so for her I swap them out. 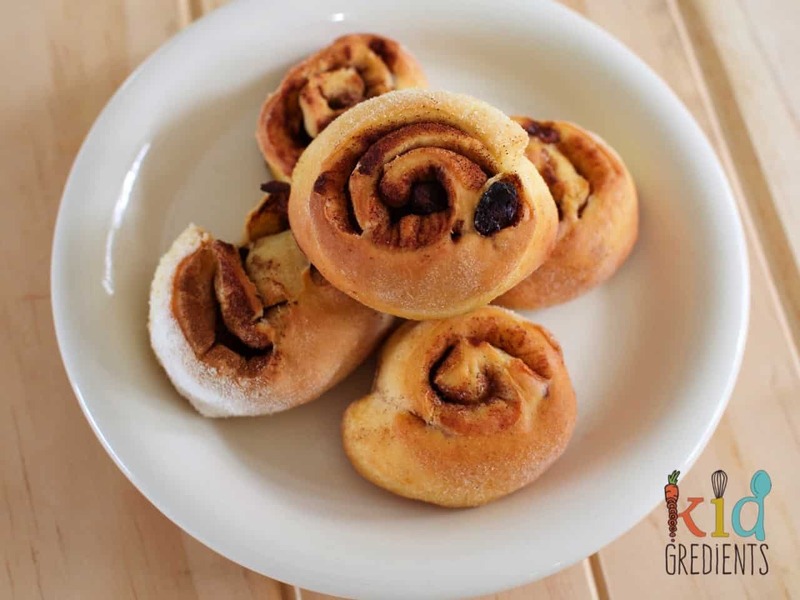 The tart flavour of the cranberries works really well with the cinnamon and vanilla to make an awesome scroll. 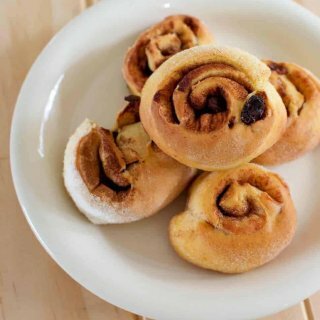 Scrolls are so versatile, you can really make whatever flavour you want and they will be awesome, one of our favourite sweet combos is apple pie yoghurt dough scrolls. When it comes to savoury, the kids love traditional ham and cheese flavours and you can even cheat a little and make these ones with puff pastry! 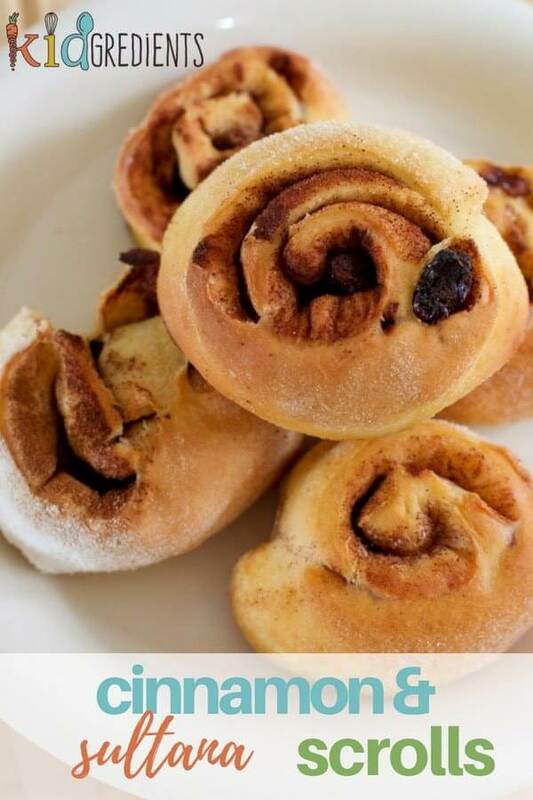 These sultana cinnamon scrolls are perfect for the lunchbox, easy to make and freezer friendly! In a mixer with a dough hook combine the vanilla, yoghurt and flour. Mix until a dough forms 3-5 minutes. Roll out the dough to make a large rectangle, 30×50 cms. Cut in half to make two 30x25cm rectangles. Spread half the cinnamon spread over each rectangle, then sprinkle with the chopped butter. Add the sultanas. Starting from the left hand side, roll the dough to make one long sausage. Cut into 12 scrolls. Repeat with the other rectangle. Bake at 180 degrees for 12 minutes. Cool on a wire rack.